U.S. President Donald Trump said on Thursday he will travel to Saudi Arabia and Israel this month, kicking off his first foreign trip, where he will work to reinvigorate traditional alliances in the region. Trump said he would also visit the Vatican along with his swing through the Middle East before attending a NATO meeting in Brussels on May 25 and the Group of Seven summit in Sicily on May 26. The maiden foreign trips of U.S. presidents often take on broader symbolic import, and by choosing the Middle East as his first stop, Trump will highlight his lofty promises to eradicate Islamic State insurgents and bring peace between Israel and the Palestinians. Trump cast his trip as an effort to build cooperation and support between Muslims, Christians and Jews for fighting terrorism. “Our task is not to dictate to others how to live but to build a coalition of friends and partners who share the goal of fighting terrorism and bringing safety, opportunity and stability to the war-ravaged Middle East,” Trump said during a speech in the Rose Garden at an event on religious liberty. Trump’s predecessor President Barack Obama had a testy relationship with both Israel and Saudi Arabia, whose leaders viewed him as being concerned less with traditional alliances than with negotiating a deal to rein in Iran’s nuclear programme. Trump has been criticized for his “America First” mantra for national security issues, for challenging allies in NATO and the Middle East to do more to pay for their own defence, and for immigration policies that have been cast as anti-Muslim. Even as he has described himself as a non-interventionist unwilling to be “the policeman of the world”, Trump has recently shown he is willing to engage militarily when he sees fit. Last month, he ordered missile strikes on a Syrian airfield in retaliation for a chemical weapons attack that he blamed on Syrian President Bashar al-Assad. The idea to visit Saudi Arabia first came during conversations the Trump team held with Saudi officials after the November election, where Saudis sought a fresh start on areas of common interest, including tackling the causes of extremism and dealing with the destabilising activities of an emboldened Iran. By choosing Saudi Arabia, home to Islam’s holiest shrines, as his first destination, Trump intends to send a message about how he wants to show leadership on global issues like the fight against Islamic State militants by strengthening alliances, senior administration officials told reporters. “What he wants to do is solve the same problem that a lot of the leaders in the Islamic world want to do,” an official said during a briefing, speaking on condition of anonymity. “We thought (going to Saudi Arabia first) was very important because obviously people have tried to portray the president in a certain way,” the official said. Saudi Foreign Minister Adel al-Jubeir described Trump’s visit to the kingdom as a historic visit and one that would entail a bilateral summit, another one with Arab Gulf leaders and the United States and one with Arab and Muslim countries. 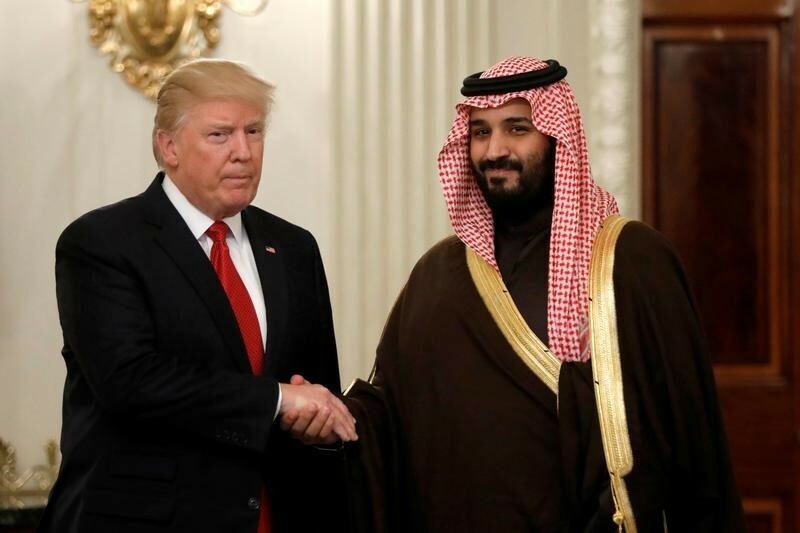 Saudi Arabia’s powerful Deputy Crown Prince Mohammed bin Salman met Trump in Washington in March in a visit a senior Saudi advisor called a “historical turning point” in relations. Trump complained in an interview with Reuters last week that Saudi Arabia was not treating the United States fairly and that Washington was losing a “tremendous amount of money” defending the kingdom. “What we’ve done is come up with what we think will be some very exciting deliverables in the meeting,” one of the officials said, declining to provide details. In meetings in Israel, Trump will discuss how he plans to broker peace between Israel and the Palestinians, a goal that has evaded many previous administrations. Trump has provided no concrete details on how he will revive long-stalled peace talks, but has asked Israel to limit its building of Jewish settlements on land the Palestinians want for a state. He has assigned his son-in-law Jared Kushner to oversee efforts. “We’ll approach it, I think, with a lot of humility,” a senior administration official told reporters during a preview of the meeting. Trump met with Palestinian President Mahmoud Abbas at the White House on Wednesday, and will meet with him again during the trip, the White House said. Officials declined to say where Trump would meet with Abbas, and also said exact dates and other details of the trip would be provided later. The Vatican said Pope Francis would meet Trump on May 24, a discussion that could be awkward given their opposing positions on immigration, refugees, and climate change.